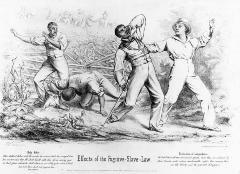 A political cartoon titled "Effects of the Fugitive Slave Law". It depicts four escaped slaves being recaptured by armed white men. Below are excerpts from the Bible and the Declaration of Independence that were used to argue against the law. Library of Congress, Washington, D.C.